Mark Allen (BA Hons [Political Science and French], University of Western Ontario, 1993; PhD [International Relations], University of Cambridge, 1997) was Executive Director of Human Rights and Indigenous Affairs at Global Affairs Canada (the Department of Foreign Affairs, Trade and Development) between 2015 and 2018. 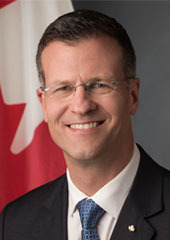 Prior to that, he was Canada’s Permanent Representative to the International Civil Aviation Organization in Montreal and, between 2007 and 2011, Director of International Relations at the Department of Transport. As a Canadian Foreign Service officer, he has served in Rwanda and the United Kingdom and has advised on Canada’s relations with the Middle East. He began his public service career as an officer at the Canadian International Development Agency.